M Fine Arts Galerie will present a rotating group collection of paintings and sculpture on view in our Boston SoWa location and Palm Beach gallery. New Works available by Eric Roux Fontaine, Goxwa, Patrick Pietropoli, Jeannie Motherwell, and Joseph Adolphe. Please contact the gallery for more information. This December, M Fine Arts Galerie will host a solo exhibition of new paintings by French Artist, Philippe Charles Jacquet titled, “Reviens la Nuit.” Jacquets landscapes; painted in quaint, nostalgic colors, appear orderly, peaceful, silent, secret, and mysterious. They are the hidden memories of an invisibile world. Poetic and of refined perfection, these dreamlike landscapes seem to evoke the passage into another world. It is in Brittany on the banks of the Rance River or towards the small coastal town of Saint-Briac with its wooded hills, its quiet anchorages, and its abandoned windmills that Philippe Jacquet draws inspiration, letting himself become immersed into his experiences. He has been roaming and navigating arounf there for a long time-along the waters, across the landscapes of granite houses, the shorelines, and the beaches at low tide. Philippe Charles Jacquet is not simply a painter of landscapes; he is a creator. Jacquet has mastered the ability to combine what is real and what is imagined. As a result, his compositions, heavily inspired by Brittany coasts and estuaries, have an element of the sublime and register deeply with the subconscious. Although he paints sparse landscapes there is something fundamentally pleasing in the surreal, idealized quality of his work. Jacquet was trained as an architect at the Ecole Nationale Supérieure des Arts Décoratifs. After pursuing his career in architecture, he decided to dedicate himself solely to painting and has been doing so for six years. One can detect his background in architecture in his heavily symmetrical, geometric landscapes. However, he successfully offsets the very calculated appearance of architectural compositions with rich colors and an intriguing variety of surfaces ranging from glass-like water to rusted, flaking hulls of barges. Jacquet is entirely self-taught and his painting technique undoubtedly sets him apart from other artists. Working in gloss paint, an industrial medium, he begins by painting his plywood surface with a uniform base of an off-white color. This medium allows him to achieve remarkably smooth surfaces. Each area of the composition is approached differently; sometimes textures are created using several transparent layers while others are achieved through the use of a razor blade to scratch away at the surface. Jacquet takes extra care when approaching the houses that often appear in his paintings. He builds, rather than paints these structures, often composing them on paper and later transferring them onto the backdrop. They effectively serve as reminders of a human presence in these expansive, dream-like landscapes. Jacquet currently lives and works in Pantin, a suburb north of Paris, where he ran an exhibition hall. He has exhibited in solo and group shows throughout France. Notably, he won first prize at the Plastic Arts Exhibition at Melun. M Galerie is delighted to offer the work of Philippe Charles Jacquet to the American market. M Fine Arts Galerie will host a solo exhibition of new mixed media works by French artist François Anton titled "je me souviens” (I Remember). Anton’s work is characterized not only by his unique use of mediums, including oil paint, gold leaf and collage on canvas, but by the narrative quality of the work; like comic strips, each of Anton’s paintings tells a story. Business suits and bright colors is not the most obvious of combinations. However, it’s with these elements that Francois Anton surprises and commands the attention of his viewers. As he juxtaposes a gray and brown color palette with bright, nearly fluorescent colors, he creates an enchanting and thought-provoking body of work that depicts the possibilities of modern life. Anton focuses his work around the relationship between adulthood and childhood, and visually represents an intersection of the two. He observes how childish imagination can disrupt a modern and structured life to ultimately provide unexpected light and excitement. Although, the paintings are playful, there is an introspective quality to the work, as well; the figures have an aesthetic reminiscent of British painter Francis Bacon and are often depicted alone, contemplating their environment. Francois Anton’s extensive body of work presents a unique perspective on our modern world, and how we choose to live in it. Each painting proposes the potential luminosity and lightheartedness that a child-like imagination and playfulness can provide. Born in 1944 in French Algeria, Anton eventually settled in Béziers in the south of France, where he currently lives and works. 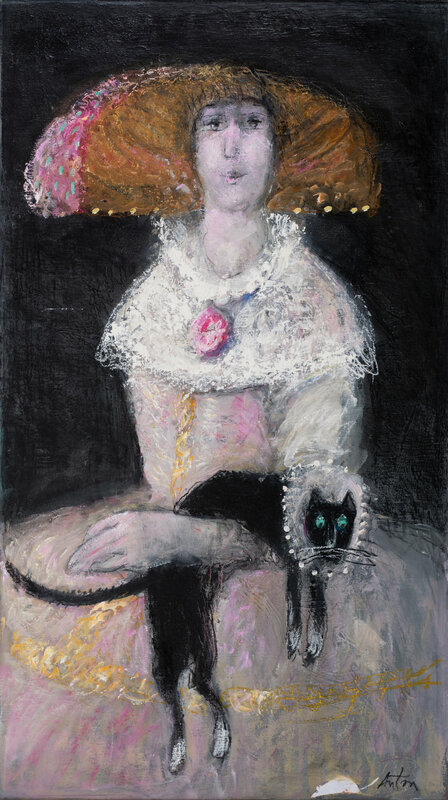 Since 1975, Anton has exhibited his work in galleries in France, Switzerland and Germany as well as in several prominent art fairs. Anton exhibited at M Fine Arts’ predecessor, Axelle Fine Arts, including a successful solo exhibition in 2014; this will the artist’s first solo exhibition at M Fine Arts Galerie. We are excited to announce that this September, we will be holding a solo exhibition for the French artist Fabienne Delacroix and her new collection of paintings titled Les Jours Heureux. We are excited to exhibit this charming body of work, focusing on the city of Paris, in our new gallery space at 460 Harrison Avenue C24 Boston, MA 02118. This exhibition represents a departure from Delacroix’s past focus on seascapes and pastoral landscapes as she instead renders the charming city life of Paris in the Belle Epoque. Though her style can be connected to her father’s—renowned painter, Michel Delacroix—she additionally draws inspiration from French Impressionism and Japanese prints. In this collection, Delacroix brings viewers on an intimate journey through the city in the era of the Belle Epoque, featuring the charming classical clothing, architecture, and atmosphere that characterize the time period. La Gare D’Orsay, is a painting from her new series, and it depicts a station that has been converted into the famous Musee D’Orsay. With Delacroix’s careful attention to the building’s ornate decorations and structure, and the elegant clothing of the arriving passengers, she shows that even in the dampest of weathers, Paris remains charming and energetic. Delacroix’s new collection also includes a suite of four paintings of Boston that briefly interrupts the Parisian theme as she paints the city of Boston. She follows the progression of a couple’s relationship through all four seasons of the year. Her wide use of vibrant color and elegant style offers a stunning rendition of Boston’s ever-changing and lively atmosphere. M Fine Arts is thrilled to present a new collection of paintings by Spanish artist, Xavier Rodes. The ground-breaking treatment of light, precise drawing and thematic originality create Rodés’ distinguished and unique style. In spite of being a figurative artist, his paintings suggest non-conventional ideas, as he focuses on the composition and the chromatic harmony rather than pure description. Rodés’ articulately rendered oil on canvas paintings each capture a very specific moment in time -­ a time when the light, the tide and the sky were just so. His works convey an unusual harmony between nature, architecture and the hand of the artist. He frequently depicts piers and harbors built into vast oceans and seas; however, his tranquil compositions of American and European towns reveal a world where man-‐ made beams rise almost organically from the water without disrupting the beauty of the natural surroundings. Whether painting sunny coastal towns, quiet snowy scenes or his whimsical still lifes, Rodés’ works demonstrate an innate ability to sensitively render light, precision and emotion. Born in 1971, Rodés studied art at EINA College in Spain, where he focused on Industrial and Urban Landscape. Following Rodés’ first exhibition in 1996, he has exhibited his work at many galleries throughout Spain. He has taken part in several international fairs such as those in Strasbourg, London and Madrid. His paintings are present in many private and public collections and in galleries worldwide, including USA, France, Switzerland, and Argentina. Today, he lives and works in El Masnou, a town not far from Barcelona. 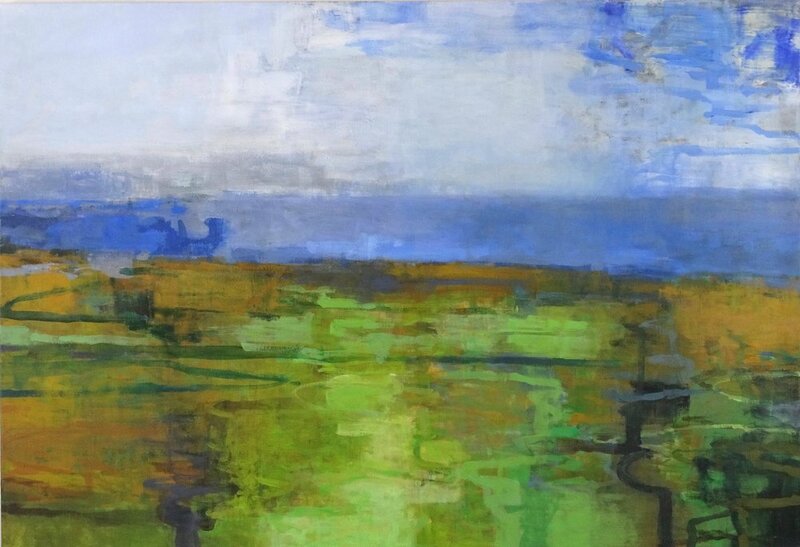 M Fine Arts is thrilled to present a solo exhibition of abstract landscape paintings by Boston based artist, Robert Baart. In this collection, “Woods & Water,” the viewer will witness his abstractive work which embodies the language of color, texture and light. Inspired by years of exploring natural spaces, this compilation of paintings will showcase a wide range of Baart’s abstract yet familiar scenes of the environment. Born in Lowell, Massachusetts in 1947, Baart’s work has stayed true to his New England roots. The artist is an avid observer of the nature of the American northeast, and his work encompasses a variety of mediums while focusing primarily on the subject of natural landscapes. His paintings employ a temporal sense of color, light, and atmosphere – blurring the line between realism and abstraction – that expresses a very personal experience with the world around him. Within his work is embedded both a concern for the deteriorating state of the modern world as well as a spirituality of nature that moves the individual. Robert Baart graduated from the School of the Museum of Fine Arts in 1969. A year later in 1970, Baart received the Clarissa Bartlett Traveling Scholarship for Alumni of the Museum School. Baart later returned to his alma mater to teach for thirty-five years before retiring in 2009. He has been awarded numerous grants and honors and has works in exhibitions and collections both in the U.S and abroad. M Fine Arts Galerie is thrilled to announce the opening reception of Benoit Trimborns’ solo exhibition of new paintings, “Un air de vacances”. Benoit Trimborn is renowned for his large-scale, stunning landscapes in oil on canvas. The French artist is trained as an architect and categorizes his work as “contemporary impressionism”; by this, he is referencing his unusual approach to ordinary subjects, his emphasis on the ethereal quality of light and his focus on the natural world. Trimborn’s extensive country and water scenes lack human forms thus they encourage contemplation and a careful study of nature. While the presence of humanity is, at times, hinted at by a well-maintained field of crops or pasture of cows, his paintings tend to highlight the immeasurable vastness of nature and the relative smallness of everything else. His work brilliantly captures the changing seasons, the fleeting visions reflected in his pools of water and the complex relationships between light, water and the sky. A full color catalog will be available. M Fine Arts Galerie will present a rotating group collection of paintings and sculpture on view in our Boston SoWa location. Our second location will exhibit new paintings by Jeannie Motherwell. Please contact the gallery for more information. M Fine Arts Galerie is is pleased to present our annual Holiday Small Works Exhibition; a selection of small format works from a group of our sensational painters, including Fabienne and Michel Delacroix. We will hold an opening reception on Friday, December 1st, 2017. Styles range from representational to abstraction, surrealism to naif, using unique and varying mediums. Through eclectic subject matter, color, texture and light, each work of art delivers a remarkable experience capable of piquing the interests of the first-time visitor as well as the sophisticated collector. M Fine Arts Galerie is delighted to announce the upcoming November exhibition of works by French sculptor Chantal Lacout. An opening reception will be held on November 3rd, 2017. Chantal Lacout was born in 1943 in Le Blanc, France. As a young child, she played with clay and had an immediate draw towards creating art. Years later, she lived in the 14th arrondissement in Paris, not far from Swiss sculptor Alberto Giacometti’s studio. She was immersed in the artist's work which continues to influence her own. She studied art at L'école Des Beaux Arts, and soon participated in numerous exhibitions in France and abroad. Lacout began showing her work in different galleries and selling to multiple collectors and museums. Over the years she has explored a variety of style and technique, but her repetitive theme of the couple remains continuously visible throughout her artwork. Her sculptures depict emotions that dwell within us all as a human race, and give substance and visibility to those emotions. The titles given to her sculptures often draw a connection with a book of poems titled Toi et Moi by French author Paul Geraldy. They provide the means for her to explore emotions which reveal all the phases of the couple. M Fine Arts Galerie is thrilled to announce, "Overflow," the upcoming October exhibition of new works by American painter Joseph Adolphe. An opening reception with the artist will be held on Friday, October 6th, 2017. Originally from Calgary, Canada, Joseph Adolphe moved to New York City in 1992 to attend the School of Visual Arts, where he received his MFA in 1994. Adolphe now lives with his wife and children in New Haven, Connecticut and is a professor of Fine Arts at St. John’s University in New York. Since 1998, his paintings have been featured in over forty exhibitions internationally and are held in numerous private and corporate collections. Adolphe has been the recipient of several awards, including the first place prize in the 2010 “Figure Now” competition at Fontbonne University in St. Louis, Missouri. In the summer of 2012, his painting Mars No. 1 was chosen for the cover of Manifest Gallery’s exhibition-in-print, International Painting Annual. The artist and his work are featured in HEAVYWEIGHTPAINT, a 2016 documentary following four painters working in Brooklyn, New York. On the surface of his canvases, Adolphe wages battle against an army of inner demons. The universal forces of anxiety, frustration, and doubt erupt into a brilliant cacophony of saturated pigment and frenzied brushstrokes. The apparent confidence of Adolphe’s creations, however, belies the existential uncertainty that informs the work’s conception. Even as the artist cagily explores themes of vulnerability and fear, his canvases exude dogged strength. The immediate power of the bull in Toro Bravo no. 38, for example—a product of his immense scale, confrontational stance, and fervid execution—begins to unravel upon closer inspection. The slashes of paint comprising his once-imposing form drip and bleed into another, gorily melding the beast with his hazy surroundings, prompting uneasy reflection on the creature’s uncertain fate at the hands of a brutal toreador. In both subject matter and technique, the artist thus strikes a precarious balance between solidity and fragility. Just as Adolphe’s finished canvases visually acknowledge the very physical act of painting, the content of his work reveals an emphasis on process rather than product, investigating the essential impetuses underlying the material world. Indeed, the marked fluidity with which Adolphe transits between subjects and genres speaks to the potent universality of his themes. Rebirth and resilience serve as connective tissue, stringing together seemingly disparate subjects by way of reference to the vital push-pull of struggle and perseverance. M Fine Arts Galerie is pleased to present the work of French painter Eric Roux-Fontaine. Souvenir du Futur will run from September 1 through September 30 with an artist reception on September 8, 5:30 – 8:30pm. The show features new paintings by Roux-Fontaine—a native of the Savoy region who now works out of his studio in Lyon. The artist’s fantastical landscapes meld the richness of memory with the limitlessness of the imagination, crafting bewitching scenes in which visual splendor couples with cerebral complexity. Roux-Fontaine trades in the aftertastes and reminiscences of our experiences, privileging the indistinct sensations left behind over the crisp contours of objective reality. The result—akin to a dreamscape in its surreal evocation of the physical world—occupies a liminal realm both compellingly ephemeral and hauntingly ethereal. Through the many layers of acrylic paint, pure pigment, marble powder, and resin that adorn his dazzling canvases, Roux-Fontaine constructs a magical world populated by dewy forests, ghostly beings, and celestial orbs teeming with dizzying light and prismatic color. The glow of stardust and moonlight is tethered by Roux-Fontaine’s virtuoso illusionism and juicily painted verdure. Just as his content necessitates a perpetual slippage between fiction and reality, so too does the artist’s handling of paint oscillate between tangibility and dissolution, deftly capturing the form and texture of matter even as he allows it to evaporate into luminous mist. Pale wisps of Queen Anne’s lace, feathery pink peonies, and luscious red-orange poppies mingle with a menagerie of fluttering birds and insects against the milky-grey background of Printemps silencieux. Behind the sun-drenched array of flora and fauna—a delightful tangle of forms alternately diaphanous and saturated—appears an empty ferris wheel partially veiled by a gossamer mid-day fog. In Gymnopédies, a majestic stag gazes out at the viewer from a dusky forest, his auburn coat dappled with speckles of pigment and leafy silhouettes. A cloud of jewel-toned butterflies forms a halo around the stag, offering the viewer an enticing passageway into the creature’s otherworldly realm. In Back Stage, a glimmering white horse leads the way into an immense, towering jungle of trees. Intricate layers of greens, yellows, blues, and pinks comprise the foremost surface of the dense woodland, the soft hues of which adopt an iridescent glow against the impenetrable darkness of the forest’s depths. A swish of the horse’s tail wafts a shimmer of marble dust through the air. The palpable sense of mysticism that shrouds these wooded scenes is heightened by the absence of human life. In Roux-Fontaine’s moonscapes, conversely, it is precisely the unmistakable evidence of civilization—unabashedly illogical in its cosmic presence—that deepens the aura of mystery. 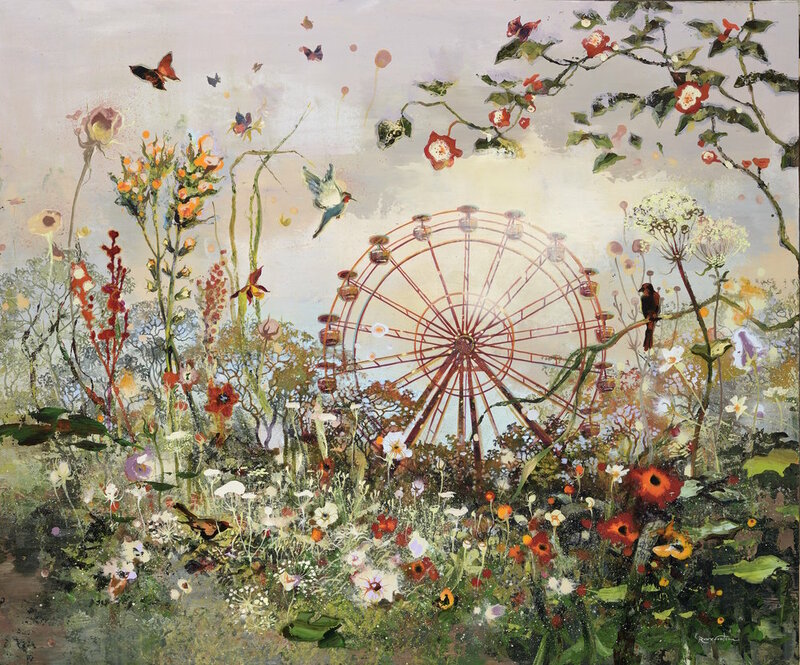 A swing carousel bearing hazily painted carnival-goers floats whimsically across the canvas of Jour de fête, superimposed on the radiant, deliciously textured face of the moon. In Dream Catcher, meanwhile, a ghostly-white cowboy stands bow-legged on a stippled lunar surface, twirling his gleaming lasso through the effervescent atmosphere. The supernatural enters Roux-Fontaine’s work only implicitly, by way of a tacit nod to the necessary existence of magic within scenes brimming with logistical impossibilities. Shreds of potential narrative, tantalizingly ambiguous in their disembodied state, emerge from Roux-Fontaine’s deliberately indistinct spatiotemporal webs. Through his self-proclaimed “modest attempt to recapture the enchantment of the world,” Eric Roux-Fontaine subtly explores humanity’s increasingly fraught relationship to nature and to itself, bespeaking the artist’s belief in the deep connectivity of existence. The works are heavily informed by lived experience and by the artist’s peripatetic lifestyle. Beyond the influence of his extensive travels in Central America, India and Eastern Europe, Roux-Fontaine draws inspiration from a wide range of artistic, literary, and cinematic sources, both contemporary and historical. From the eerie, inventive landscapes of Peter Doig to the magical realism of Alejo Carpentier, the multidisciplinary nature of Roux-Fontaine’s inspiration reflects his markedly expansive conception of the artist’s role. The painter, Roux-Fontaine asserts, functions as a film director in essence, assembling and orchestrating a medley of sets and actors in order to perceive and reveal the most intimate of hidden truths. In 2011, Roux-Fontaine delivered a talk at the prestigious TEDxLyon event on the importance of questioning our underlying preconceptions about cultural identity and difference, inviting the audience on what he calls a “geo-poetic journey.” His work is part of the permanent collection at the Musée des Beaux-arts in Chambéry and the Musée Paul Dini in Villefranche-sur-Saône. There will be a printed full cover catalog available. M Fine Arts Galerie is thrilled to announce the Summer Collective opening with a reception on Friday, July 7th, 2017. For this show, each of our twenty exceptional artists created new pieces that will be on display during the duration of the summer. Several of the artists will be present to discuss their work at the opening reception. M Fine Arts is pleased to announce a solo show of new works by American artist, Mark Knoezer. The exhibition, “Love Blooms,” will open with an artist reception on Friday, June 2nd. The unusual, glossy, glass-like geometric pieces represent Knoerzers’ uniquely personal visual language. Mark Knoerzer is best known for his abstract paintings and light installations. 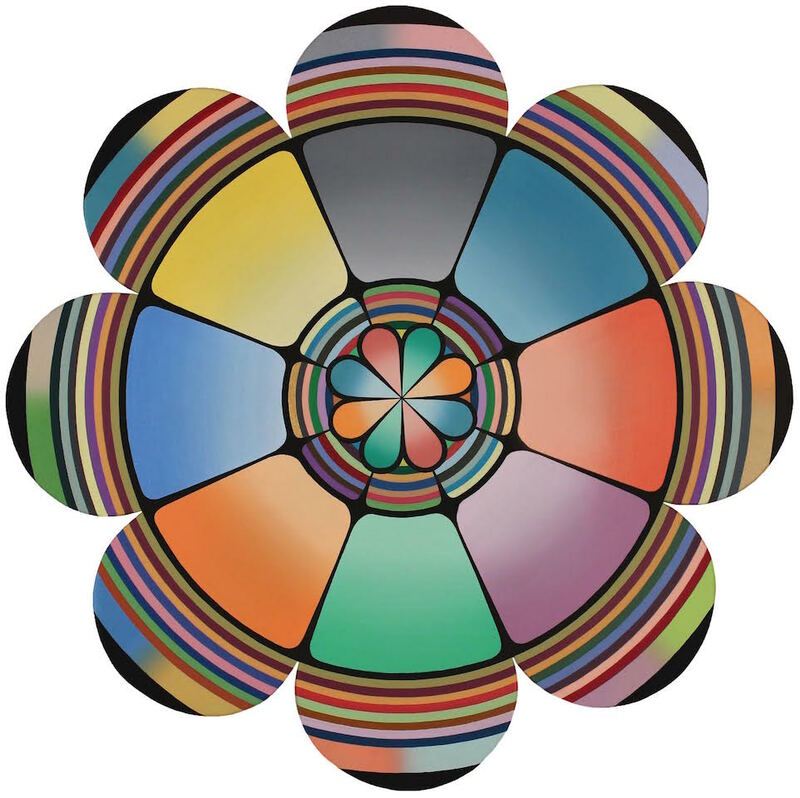 Using color and extensive layering to create geometric images and emergent symbols, Knoerzer has developed a unique visual language that, while often highly formal and even symmetrical, nevertheless reflects an intense commitment to beauty and the sheer pleasure of seeing. Knoerzer’s works are brought to fruition through an extensive and meticulous layering process. He first hand draws his designs, then outlines the shapes with acrylics and fills them in with oils – sometimes he uses up to 15 layers of paint depending on the intended effect. Afterwards, Knoerzer coats his paintings with 3 layers of epoxy to achieve the high-gloss finish. The artist’s unique technique is the result of his experimentation with various mediums from an early age and his experience with 3D light installations. Indeed, Knoerzer was interested in art since childhood and his parents supported his talents by enrolling him in several art classes. Learning to use various mediums, including ceramics, oil paints and carpentry, Knoerzer knew he wanted to pursue a career in the arts. Knoerzer’s work has appeared in documentaries as diverse as Evocateur: The Morton Downey Jr. Movie, which was selected for the Tribeca Film Festival and released in 2013 by Magnolia Pictures, and Elevated Thinking: The High Line in New York City, narrated by Susan Sarandon, which aired on PBS in 2014. Recent exhibitions include M Fine Arts Galerie, Massey Lyuben Gallery, Bertrand Delacroix Gallery, Art Palm Beach, Recession Art’s Big Future, The Rising Arts Gallery’s Represent Brooklyn, Create NYC, Webster Hall’s Quarterly Art Soirée and Light Up Brooklyn (presented by Google Places). Born in 1978, Knoerzer received an Associates of Fine Arts from the Fashion Institute of Technology and a BFA from Parsons School of Design, where he was awarded an Undergraduate Deans Scholarship and a BFA Scholarship. He studied theater backdrop painting at the Studio and Forum of Scenic Arts in Cornwall, NY. He currently lives in the Hudson Valley, where the tranquility of the environment is the driving influence behind his latest exhibit, Love Blooms. The landscapes of Philippe Charles Jacquet, painted in quaint, nostalgic colors, appear orderly, peaceful, silent, secret, and mysterious. They are the hidden memories of an invisibile world. Poetic and of refined perfection, these dreamlike landscapes seem to evoke the passage into another world. Brig Bad Trumpet Player, oil on canvas, 56" x 64"
M FINE ARTS GALERIE is pleased to present Party Animals, a solo exhibition of new works by Brian Keith Stephens. Stephens is well known oil painter and installation artist whose work affects perception of identity through emotion. Stephen’s artistic process reflects the emotions he hopes to extract from his audience. While Stephens paints seemingly simple images of animals or loved ones, upon closer observation it is clear there are multiple layers of sensitive investigation in each piece. Growing up in Connecticut, I have always found animals as a vessel for depicting human emotion; I believe in many ways animals are capable of expressing human emotions is a way that is both understandable and mysterious and alluring. Like animals, we are all wild and fearful, but unlike animals, we have to live in this world of rules and normativity. My desires, my emotions, are not always able to fit in the place and society I live, but in my art, I can find a place for those outliers to join forces. The Life of the Party, oil on canvas, 8.5" x 13"
"How to capture the past, present and future at the same time; this is at the center of my work as an artist and as a father, son, friend and lover. As we navigating our daily lives, we must face thoughts, anxieties, joys and emotions from all three of these tenses, and often at the same time. Seemingly opposite emotions -- lust, hatred, desire, love, pride, inhibition -- exists simultaneously between these moments in time. For some of us, some emotions outweigh others, grabbing our attention and transfixing our minds, sometimes taking over the way we live and breathe. For myself, the emotions that occupy my mind and capture my energy are that of love, desire, and the fear of hurt or disappointment. And so, at the center of my work are these forceful emotions--they guide my hand to paint and my heart and mind to live. My work explores the emotions that guide us, that pull us and push is and ultimately define who we are, in relation to others and to ourselves. Stephens received his BFA from Lyme Academy College of Fine Art and his MFA from City College of New York. He has exhibited in galleries around the country and internationally. He has participated in multiple art fairs such as Scope Art Fair and Affordable Art Fair. 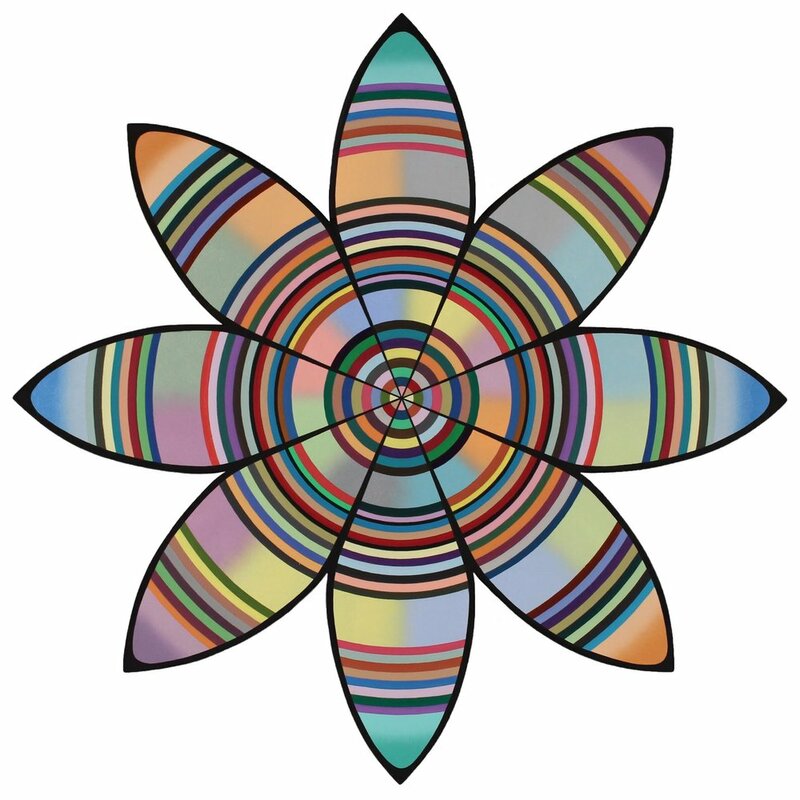 M Fine Arts is pleased to announce an exhibition featuring Kim Sobel’s cutout works this February. These vibrant contemporary installations will transport you into another space entirely. The exhibition will begin on February 3, 2017 with an artist reception at our location in Sowa at 61 Thayer Street. Kim Sobel creates paintings using expressive marks and colors in order to make sense of the work. Her paintings move outside of the canvas. Her works include cutouts and mix media installation pieces. Sobel states that, “A painting is inanimate, but I want it to live and breathe.” This statement is apparent as immediately as the viewer steps into the space her works occupy. Sobel received her MFA from Hunter college and has spent time lecturing and teaching while pursuing her studio practice. She has taught at schools including The New School in New York and Manchester Community College. She has received many prestigious awards and fellowships over her career. We are pleased to present a remarkable collection of new paintings by Michel Delacroix, celebrated master of the Naïf tradition and self styled “painter of dreams and of the poetic past.” Internationally acclaimed for his nostalgic visions of the city of light, Delacroix has devoted over six decades to painting what he calls “the Paris of then,” the dream-like place the city became during the 1940's. From sweeping skylines of the Eiffel Tower and Notre Dame Cathedral to quiet, snow covered Parisian streets, these works filled with beauty and romance are sure to sweep you back to a city of by-gone years and innocent splendors. On Friday December 2nd, M Fine Arts will host a special reception for the latest collection of paintings by Michel Delacroix. We are thrilled to present you with Fabienne Delacroix's first soloshow at M Fine Arts Galerie, Y' a de la Joie. This exhibit will usher in a new phase while continuing on a legacy created by Bertrand Delacoix at our former Axelle Fine Arts on Newburystreet. We invite you to please join us on October 8th (6-8pm) to welcome Fabienne to our new location found in the SoWa Art District. Parking is also available just steps from our gallery. Fabienne Delacroix, "Les 12 vues de la Tour Eiffel Octobre", acrylic on board, 12" x 16"
Born in 1972 as the third and youngest child of renowned naif master Michel Delacroix. Fabienne Delacroix enjoyed a high level of apprenticeship following her famed father's tutorial. By the age of ten, her work was shown for the very first time at a gallery in Carmel, California. The show sold out opening night.In the years since, her work has been displayed in New York, San Francisco, Seattle, New Orleans and Japan where she exhibited along side her farther. Fabienne Delacroix’s growing fame has also led to numerous prestigious commissions and is collected internationally. Benoît Trimborn, "Le soleil et la foret", oil on canvas, 59" x 74"
M Fine Arts is proud to present Summer Selections, a specially-curated group exhibition featuring old favorites and new works from our diverse roster of artists, including Michel Delacroix, Benoît Trimborn, Goxwa, and more. From the waters of the Seine to the rooftops of Paris, Town & Country celebrates the works of French painters Patrick Pietropoli and Benoît Trimborn. One known for his intricate portrayals of the urban landscape, the other for his serene, tranquil works showcasing the French countryside. Patrick Pietropoli is a contemporary painter artist who represents cityscapes and street scenes along with figural compositions and delicate nudes. He paints the carefully articulated architecture of New York, Paris, Rome and Venice as well as the intimate portrayal of the feminine figure always finding a perfect balance between freedom and form. Born in Paris in 1953, his passion for painting started in early childhood and developed through various experiments with fine arts techniques into a life-long commitment. His canvases favor line over color while representing objects from the history of art, architecture, cityscapes with or without figures, female figures. The ancient Greek myths are like a permanent “lietmotiv” in his work. His first solo exhibition in 1981 was about the Florentine Annonciations, the second one was about “the rapt of the Sabines”, as it is represented in the painting of Nicolas Poussin at the Louvre. Patrick Pietropoli spent most of his life in Paris and relocated to New York in January 2008. A statement from Benoît Trimborn: "The morphology of the landscapes, or more essentially, the space that the countryside paints, draws my attention and is like the spark of an idea. As an architect, I see there a breath, a light, a rhythm that can form on its own a principle of beauty. Thus, in painting, I am guided by these places of the countryside, they go through the seasons, but also through meteorological and agricultural variations. So, I imagine the passage from the space of the countryside to the space of the canvas. It is a passage to do without useless chatter, because everything is there. More than using the painting as a means of communication of my own message, I prefer making the painting talk, leaving it to "say the last word". The represented elements compose atmospheres whose impression I seek to accurately convey, like the musician, who accurately follows his sheet music. The figure of the man, who is never represented, is, however, sensibly present in these strongly altered and elaborate landscapes. In this effort, the contemplative attitude prevails, much more than the adventurous attitude. No message and no story should disturb the viewer's perspective." M Fine Arts Galerie is honored to announce the addition of Robert Baart to our roster of contemporary artists. Born in Lowell, Massachusetts in 1947, Baart’s work has stayed true to his New England roots. Baart is an avid observer of the nature of the American northeast, and his work encompasses a variety of mediums while focusing primarily on the subject of natural landscapes. His paintings employ a temporal sense of color, light, and atmosphere – blurring the line between realism and abstraction – that expresses a very personal experience with the world around him. Within his work is embedded both a concern for the deteriorating state of the modern world as well as a spirituality of nature that moves the individual. Today, Baart is a member of the Fenway Studios, a limited-equity cooperative that has served Boston's art society since its conception in 1905. The Studios maintain a rich history of housing many of Boston’s most prominent artists and teachers, a legacy that continues to this day. 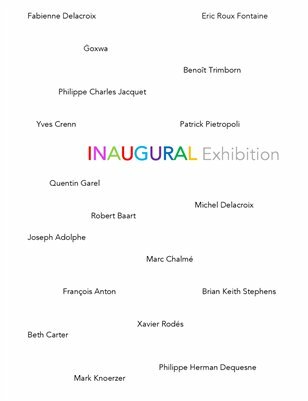 M Fine Arts Galerie is thrilled to announce the "Inaugural Exhibition" opening with a gala reception on Saturday, May 7th, 2016. For this premiere show, each of our eighteen exceptional artists created new pieces that will preview here for the first time. Several of the artists will be present to discuss their work. Come join the revelry, meet the artists and explore each piece's unique narrative. Take a closer look at the featured works and get to know the artists below.